I attended a lovely opening of “Warhol:Jackie” at Blain Di Donna gallery and dinner followed at La Grenouille. “Deeply affected by the media coverage of JFK’s assassination, Warhol began the Jackie series in February 1964, continuing the Death and Disaster theme of his first European exhibition with Ileana Sonnabend in Paris, in January of that year. 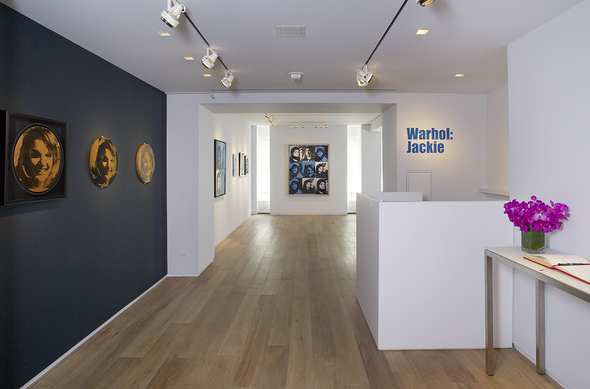 Warhol: Jackie has been curated in close collaboration with Bibi Khan, former curator of the Andy Warhol Foundation; it will be accompanied by a fully illustrated catalogue with an introduction by Bob Colacello, writer, former Warhol associate, and an essay by Judith Goldman, writer, former Whitney Museum curator and noted Warhol expert.